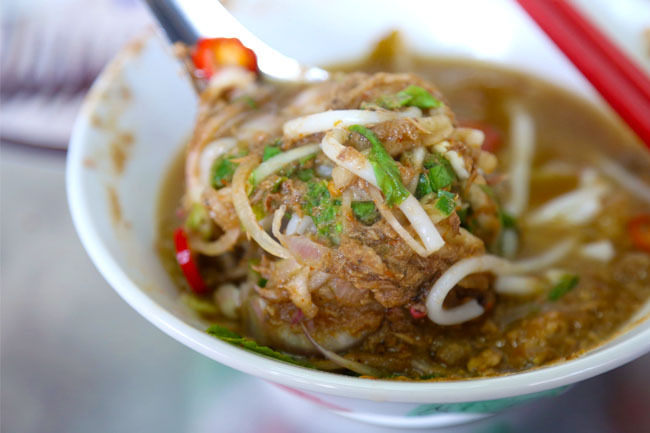 [Penang, Malaysia] Penang Assam Laksa… CNN Travel ranked this 7th out of the 50 most delicious foods in the world. If I am going back Penang again, and can only eat one item, the Assam Laksa will be it. 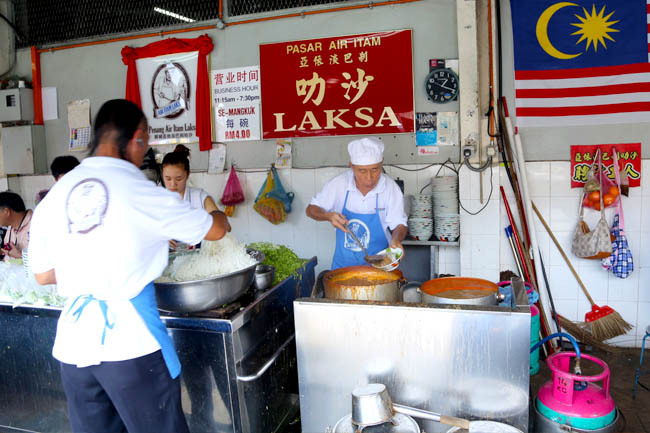 This popular stall at Jalan Pasar next to the Air Itam market, at the foot of a main tourist attraction Kek Lok Si Temple will be the place to try it. 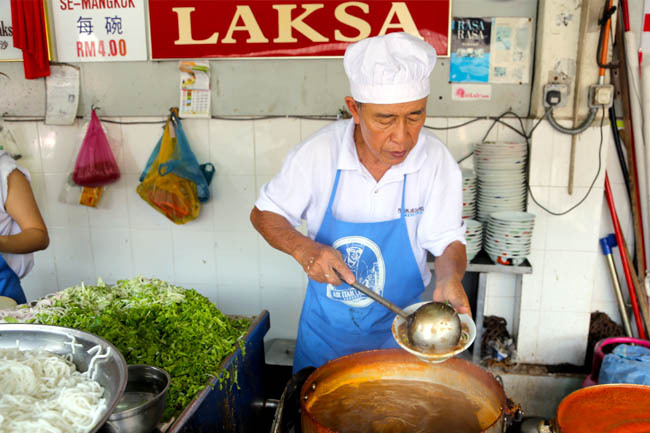 You would notice this uncle (the owner) scooping up the aromatic soup in and out the bowl in quick succession, and he does this repeatedly so that the thick vermicelli gets covered thoroughly in the gravy and the dish stays hot. He has a chain of staff helping with assembling the other key ingredients of cucumber, onions, red chillies, pineapple, lettuce, mint and ginger. RM4! Each bowl only cost 4 Malaysian Ringgit (SGD$1.60, USD$1.30) which is such a steal. Finding a couple of seats on a crowded weekend afternoon may cost some sweat and time, but rest assured this is well worth the wait. The bowl arrived, brimming with Penang’s signature ‘hae ko’ (thick sweet prawn paste) and shredded mackerel fish. 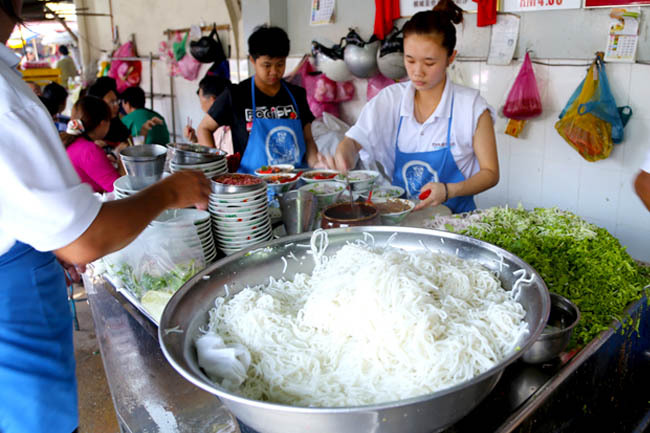 As you scoop up tablespoons, the strands of thick rice noodles are covered by the generous ingredients. First bite… Umami! So Shiok, can! The soup is thick with balanced taste of sweet, sour and spicy, added with lingering touch of the prawn paste. It’s a small bowl, but satisfying, and some may want seconds. 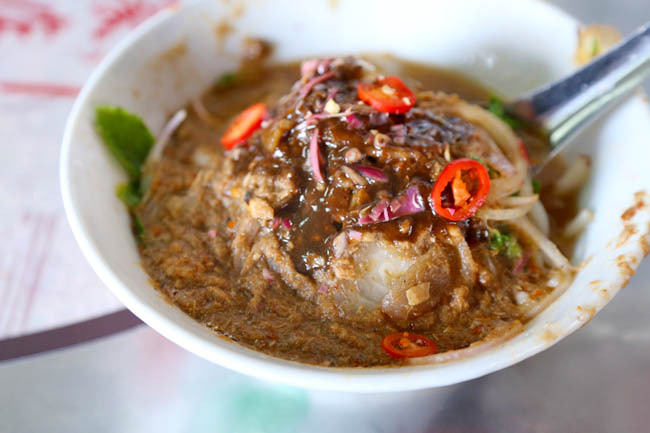 Some other places of Penang Laksa include Joo Hooi Café at Jalan Penang, Taman Emas Coffee Shop at Jalan Gotlieb, Gurney Drive Hawker Centre, Kafe Lok Pin at Jalan Anson and Balik Pulau. Just thinking about Air Itam Laksa makes me want to fly back there. I am sure I can’t find such a flavourful bowl of Assam Laksa back home. I finally ate this one when I was in thailand last week for a vegetable carving competition. The food was really an asian authentic.